So, there's a certain pattern that our family seems to be falling into for our vacations and out-of-town trips. let's see if you can pick it up...last year, we went on an overnight trip to Cincinnati to go to a Pirates-Reds game, then went to the Columbus Zoo and a Columbus-area TJ's on the way home. This past July, we went to Detroit for another trip. First stop: Trader Joe's. Second: Pirates-Tigers game. The next day: Toledo Zoo. And on our just completed vacation to the Portland, Maine area: Trader Joe's in South Portland (huge store!). A Sea Dogs-Senators (minor leagues) game. And on the recommendation of our tremendous hosts from Airbnb, the Maine Wildlife Park, which is basically a zoo. We had a confirmed moose sighting! Fun trip, where we did plenty of other things, but yep. Apparently we like our baseball game/TJ's/zoo treks. Works well for our family, I suppose. I mention this because, at that aforementioned ginormous South Portland TJ's (the size of a small WalMart! 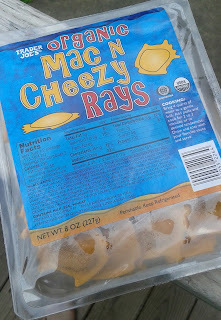 ), we first spotted Trader Joe's Organic Mac N Cheezy Rays. We really wanted to get them but alas, the promise of fresh seafood dinners every night was too strong to sway us for another meal option. We again spotted them at the Princeton, NJ TJ's (booze!) on the way home, but had no great way to refrigerate them all the way back to the 'burgh, so again, we passed. With much relief, our regular stop, Pittsburgh - North Hills, had these new-fangled ray-violis for our fridge/pantry restocking trip upon our return home. To be honest, I'm a little torn on them. Like most things in life, these mac 'n cheese pockets have pluses and minuses. But overall, if I had to choose, I'd say I like them. Quite a bit. The noodles themselves are a good, firmer variety, with much more bite then the typical smushy Krafty elbows that you can swallow without chewing as a kid. And with ricotta as the primary filling ingredient, I was a little apprehensive at first - I'm usually not a huge fan - but it melds well with the cheddar to make a smooth, creamy, pretty satisfying cheesy stuffing that was palatably pleasing for the wife and me, as well as our kiddos. Plus, it's kind of a fun shape, too - granted, they don't look exactly like sting rays (no stinger tails! ), but it isn't too much a Rorshach inkblot-esque stretch, either. Our toddler bought into the concept pretty easily and it seemed to add to the lunchtime experience for her, with a couple added grins and a goofy laugh or two. So, what's the negative notes? Well, a couple. First, the dough doesn't seem to hold particulary well together at the seams - there were more than a couple rays that burst their guts while cooking, losing their cheesy innards to the boiling ocean around them in the process. Bummer. Plus, as kind of a strange note, the package says to "add your favorite sauce" to them - huh? Potentially aside from hot sauce, what sauce would one splash on here? Sandy buttered hers up some, but butter doesn't count as a sauce. Marinara seems like an off choice. And then, there's the cost: $3.99 a package. It's not a rip-off, but not a great deal either. 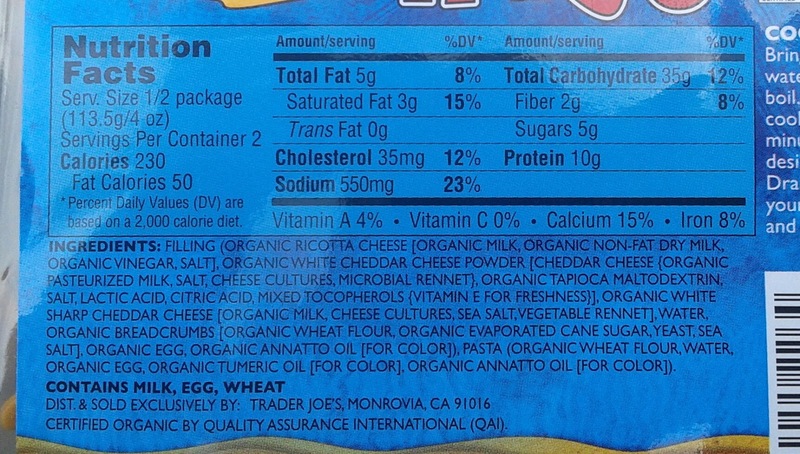 My frame of reference for this is considering that one can get a 12 pack of Annie's branded organic mac n cheese for like $10 at Costco, and the fact that we needed to buy two packages of this to make a reasonable meal for two adults, a toddler, and a baby seemed a little, well, off. Also, unsurprisingly, the sodium count....yeesh. Let's think of more ways to get flavor without salt, shall we? Please? Anyways, there's a good chance we'll get them again. If anything, our toddler loved them, and there's a good chance that most kids would, too, giving their folks a break from the usual mac 'n cheese doldrums. With a little coaching, our kiddo gave them a perfect assessment ("Five! Fivefivefive! "), and she's had enough mac 'n cheese to know her stuff and be considered an expert, so I'll go with that. Sandy would give them about a 4, with me perhaps a 3, so let's average those out. 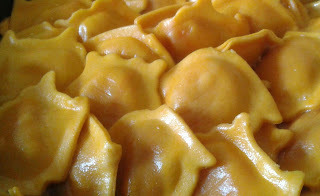 http://www.nuovopasta.com/products/consumer-pack-collection/mac-cheezy-ravioli-fish-shaped-9-oz-2/. This is the product! It does sound good but little expensive for me. I tried the Key Lime tea cookie the other day when they were handing out as samples. Thought it was great. But why sting rays?? Why sting rays?? update: my tj's was sampling this yesterday. Curious manta shape be darned--this was freakin' awesome! I believe it was sauceless, but still seemed creamy. I love the Columbus zoo, it's one of the very few things we miss now that we've moved across the country. If you drive through or past Columbus on the way back, you really should stop for ice cream at Jeni's it's the best ice cream ever. I bought these before they made it onto your blog. I was going to go with just butter... I also have a packet of annie's cheese left from when I had to use the pasta without the cheese. What do you think about adding cheese sauce to the cheese raviolis? lol. The mention of Detroit pulled me out my lurking spot. The zoo's nice, even if it is in Royal Oak. The stadium is great too. I do wonder which TJ you went to. I think both Royal Oak & Ferndale have one and both are within driving distance from the zoo. Cute! I thought they were manta rays. It makes sense to leave off the tail. They'd probably fall off, anyway. i found these absolutely awful. so did my son. 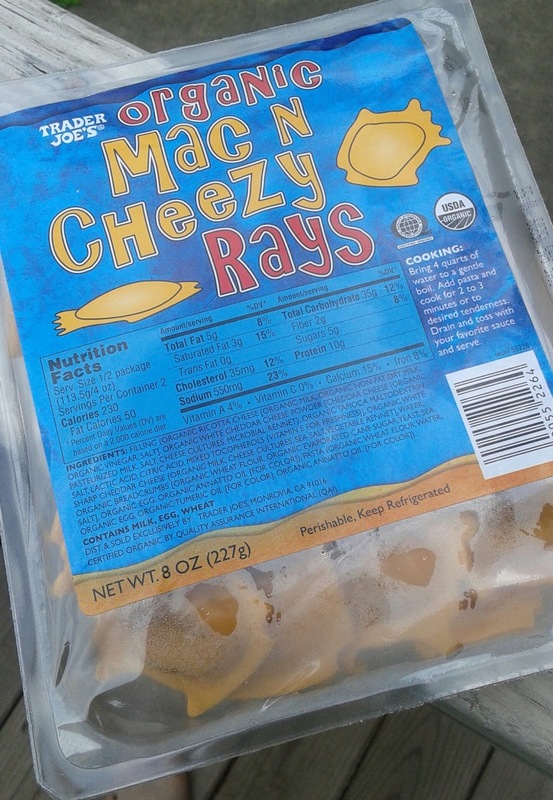 the taste of fakey cheese in weird shaped rays that fall apart in the water. we ended up throwing them away and making something else.